We're proud to introduce our newest roof hatch line, our Economy Series Roof Hatch. For a low cost metal roof hatch you can't do better than this. These prime coated galvanized steel hatches come in 24"x24", 30"x30", 36"x30", 36"x36" and 48"x48" and are designed for economical and convenient roof top access. The covers have 1" insulation and have a continuous EPDM draft and weather seal liner for flush, tight fitment. 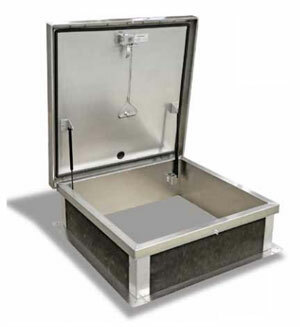 Our economical roof hatch cover is designed to support a uniform live load of 40 lbs./sq. ft.
Cover and 12" high curb are both 14 gauge Galvanized steel (0.091") and the roof hatch curb has 1" thick fiberboard insulation. The hatch's curb has cap flashing for a secure weather-tight installation. The economical roof hatch has zinc plated hinges with gas spring operators to allow easy opening and also has a built in hold open arm and pull handle. Finish is a baked on grey enamel polyester. These hatches also come with a 1 year warranty on material and workmanship.